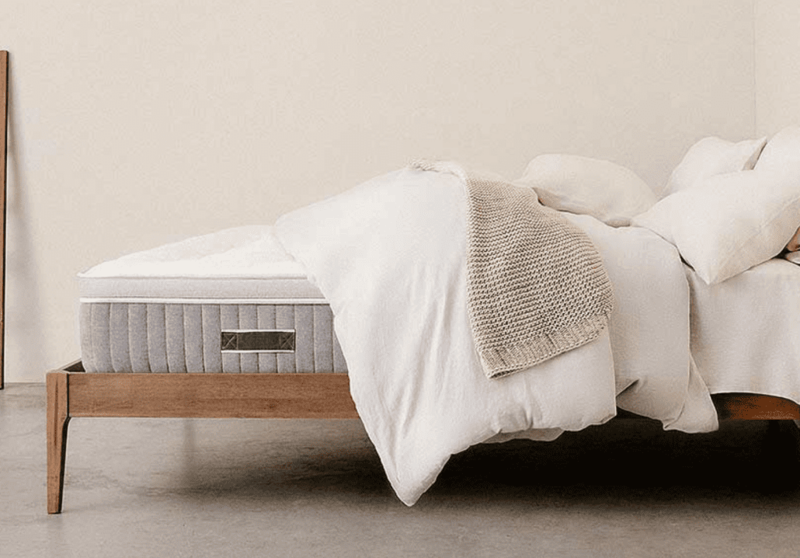 Awara Sleep Natural Hybrid Mattress Review | Is it the best or a Knock Off? Introducing the Awara. They have set out to be a well priced natural mattress option. Latex foam has great support and sleeps cool. See the full review below. With their Latex Hybrid Mattress Awara managed to produce a high-end product at a moderate price range. Priding itself as an environmentally friendly and all natural product, Awara Latex Hybrid mattress seems to be a highly coveted merchandise that will provide good night’s sleep and guilt-free conscious for eco-friendly customers. Awara Mattress comes in 7 sizes, ranging from twin size, going to full Cal King size. With the 13 inches of naturally-sourced materials on all sizes, this Latex Hybrid seems to offer the highest quality for a reasonable price. 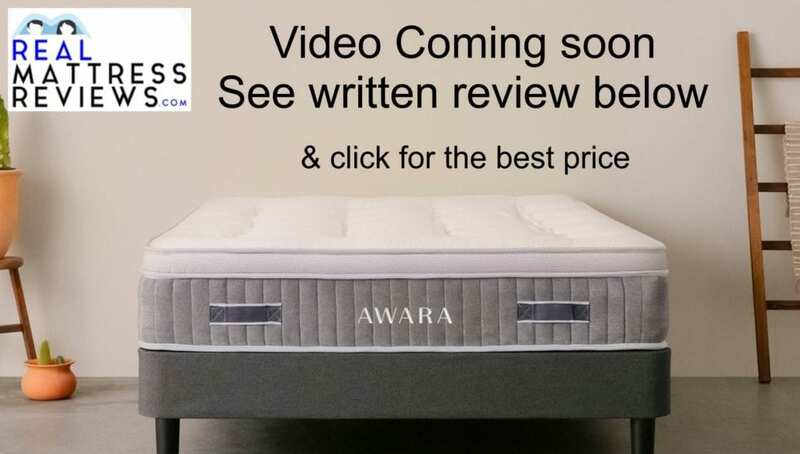 Awara mattress left an excellent first impression. This seems to be an exceptionally good choice for everyone looking for something supportive and less prone to enveloping you inside. The relative firmness that latex hybrid provides is present here. It is a welcome feeling for anyone who does not enjoy being fully enveloped by your mattress. Everything about this screams of good quality and good night’s sleep. 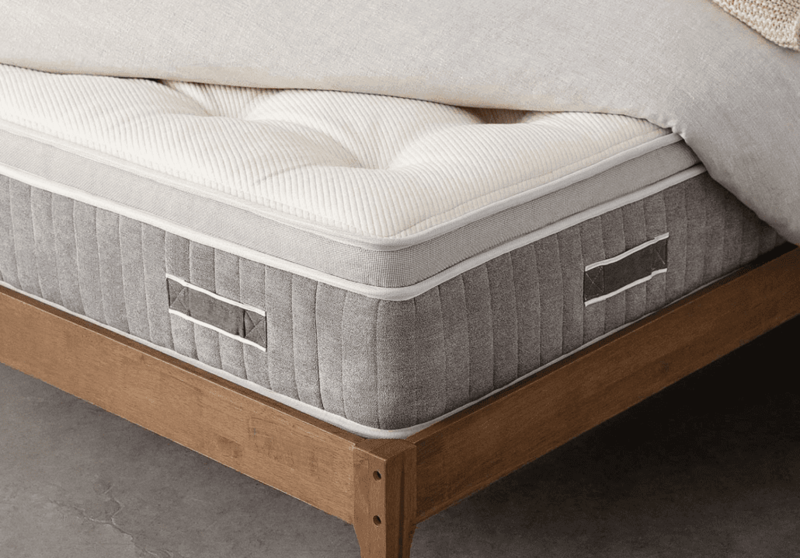 Let’s take an in-depth look at all the qualities of this Latex Hybrid Mattress and make sure that it holds up to a generous first impression it had. Awara’s website provided a comprehensive guide to their product. Information on the website is easy to access and navigation on the site is top-notch. Their website offers detailed information about products technical specifications. Information about the trial period, warranty, shipping and available financing does not require navigation, as it is written on the home page. Smart move on their part, as all of those offers, are pretty generous and makes them stand out from other manufacturers quite easily. Everything about the design of the website point to a class. It’s effortlessly minimalistic while managing to contain all the information that a potential customer might need. The reviews are available at the bottom of the home page but are highly visible. Clearly, they know that customers are happy enough to put it there. This review section is unusually useful. You can find filters here, that are not available on most other websites, and which will help you make up your mind in no time. Not only can you filter reviews by the rating, but can also set specific filters, such as “Trial Period”, “Customer Service” and etc. After selecting these filters, you will be navigated toward reviews that specifically address this aspect of the product and company. A very smart system that is easy to use. Social media account are also linked on the main page. However, at present moment there does not seem to be much activity there. As expected, support is available via phone, e-mail and live chat. For their simple and intuitive design, good implementation of review system and availability of information about the product and company, I give Awara 10 out of 10 for branding. When it comes to comfort and feel of the mattress, few if any of Awara’s competitors have managed to come as close to providing me with the same quality of life improvement. First of all, the quality of the materials used here has blown my mind. The comfort layer materials have been certified by GOLS (that a global Organic Latex Standard for you). The cover, which is made of organic cotton has been certified by GOTS (Global organic textile Standard). That’s all good and admirable achievement in term of quality control, but let’s discuss how it actually feels to sleep in. The mattress itself is considered a medium firm, which is slightly more firm than non-latex based products. This provides a level of support which I feel most comfortable with, as I do not enjoy sinking in the mattress. Despite It being supportive and one of the thickest matrasses I ever had a pleasure sleeping on (It’s a full blown 13 inch), It is still able to accommodate your body shape. It will change its surface enough to accommodate the specific form of your body, but will not overdo it. You won’t sink into your mattress. Some people enjoy that feeling, however, I don’t find it natural. Over the top softness of surface was not what our bodies were created for. This is why Awara mattress is comforting and natural simultaneously. Your body feels in a natural environment and takes its time to provide you with full night’s sleep. If you are suffering from tension or pains, this mattress will do wonders for you. The body-conforming which the extra tick comfort layer provides, will not only elevate excess pressure but will make sleeping in any position a viable option. As advertised on their website, the mattress shipped within 24 hours of the purchase. It takes 2 to 5 business days to arrive, once it has shipped. I received mine in 4 days, delivered by FedEx Ground. It is also pointed out on the website that for an additional fee you can opt in for a White love Delivery service. Their website is the only place you can purchase the mattress. Not having any middle man is what makes the prices here reasonable. There is no special setup required for Awara mattress. Just put it on a suitable surface and you are ready to go. Due to all organic material, there is practically no off-gassing involved. The smell is usually caused by chemicals, which are simply not used here. Also, since there is no foam involved here, it’s one less reason for any foal smell to be present. If you have a strong sense of smell and you feel something, it will probably be the smell of the storage area. This should go away pretty soon. Coils and latex themselves do not have any noticeable smell. So, in this category Awara mattress is untouchable. This again is due to all natural and organic materials used. As mentioned above Awara is both GOLS and GOTS certified. The materials include 4 inches organic Dunlop latex, organic cotton, coil system. Everything in Awara is derived from natural and organic resources. The outer layer of the mattress is a combination of organic cotton and wool in an exquisite design meant to keep you comfortable and cool. Next layer is a much talked 4-inch organic latex (GOLS certified). 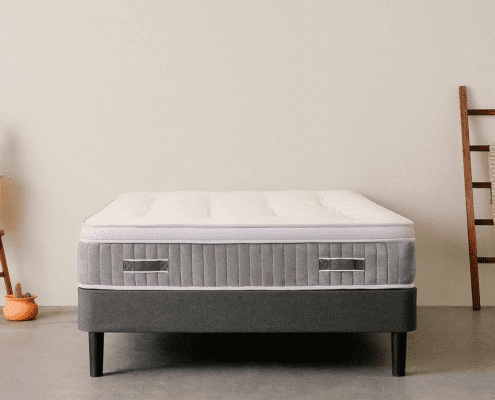 It has a slightly above average firmness, meant for providing natural sleep experience. You won’t sink in it as in foam, but it will accommodate to your body position adequately. Last but not least is a 9-inch coil that is individually wrapped to provide maximum support and remove any excess pressure from your body. Purple will work great on any solid surface. The floor, platform slats, boxspring/foundation and they now offer an adjustable base as well. Organic and natural is what make Awara shine in this category as well. 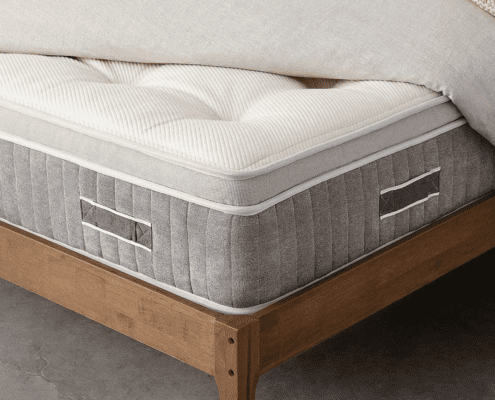 The organic cotton and wool cover in combination with coil layer and signature latex makes this mattress a living and breathing thing. In short, due to the constant air flow, there is no possibility that you will be trapped under you blanked as in a furnace and be sweating all night. We all love that feeling when we touch an empty space on the bed and it is still feels cool. That’s basically what you get with Awara mattress all the time. Due to its latex layer, the hot air will not get trapped in the mattress and you won’t wake up in a sweat ridden bed. All the solutions to our problems are in nature. The latex has intrinsic properties, which will keep your bed from overheating. In combination with organic cotton and wool cover, which will get rid of any excess moisture, your sleep won’t be interrupted with any discomfort. Even with all this precaution, the heat retention will be further taken care of by a coil layer. Awara Hybrid Latex mattress gets 10/10 for excellent design and materials which prevent it from overheating. I would not say that Awara mattress suffers in the category of motion reduction, but due to its nature (being a hybrid), it has a hard time competing with all-foam mattresses. Because it is made of latex, it can also be a bit bouncy. Especially in cases of heavyweight sleepers. This is not to say, that you will bounce off your bed (due to a polymer which reproduces the full-foam effect). It’s just a nature of the materials and consequently, it cannot exceed in this category. 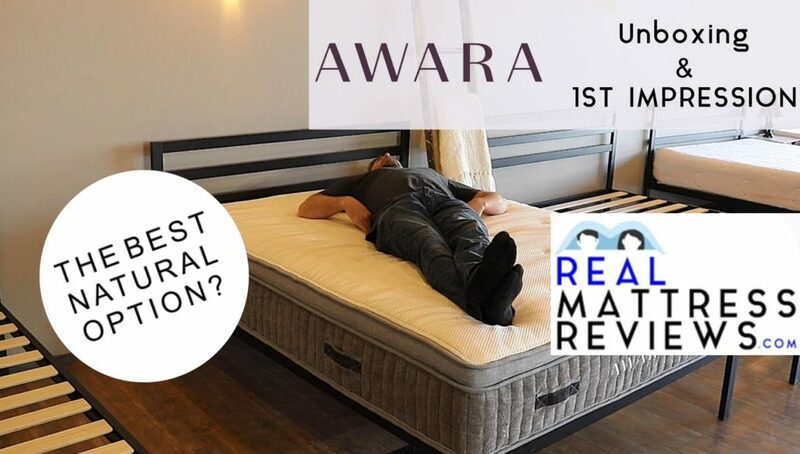 However, it has to be mentioned that when competing with other hybrid mattresses, Awara does come up on top. Unlike the cases with foam mattresses, where edge support is often an issue, here you have an outstanding performance by Awara Latex Hybrid mattress. Due to the nature of latex, which is then supported by coil layer, your mattress will perform well no matter the weight. You can be safe and sure that you won’t get that “roll off” sensation with Awara. The Awara will work splendidly on an adjustable base. If you want to sit up all the way it might be a little tricky since it is very thick but it will bend for normal adjustable base users needs. Awara Latex Hybrid Mattress comes with free shipping and is usually delivered by FedEx Ground, however for a small fee you can opt in for a White Glove delivery. It takes 24 hours to ship and further 2 to 5 days to arrive. The mattress comes with smashing 365, a full year of trial! This is an outstanding offer, most other companies offer 100 days tops. This is a real deal breaker and solely by itself a reason to go for it. One thing that stands out here is a FOREVER WARRANTY. Now, this is something that you don’t see often. Most companies opting in for 10 or so years of warranty. Only a company that is certain about the quality of their product would offer such a warranty. This goes beyond anything that is expected from a mattress manufacturer. There is also an option of financing through Affirm. If you are qualified for that, you can pay in installment for 24 months, instead of going for a bulk payment. The Bear Mattress founders have been in the mattress business over 25 years ago. There are over 100 reviews on the website and almost all of them have only positive to say about the product. This is one of the best product available out there. The degree of quality that comes with a very reasonable price is astounding. 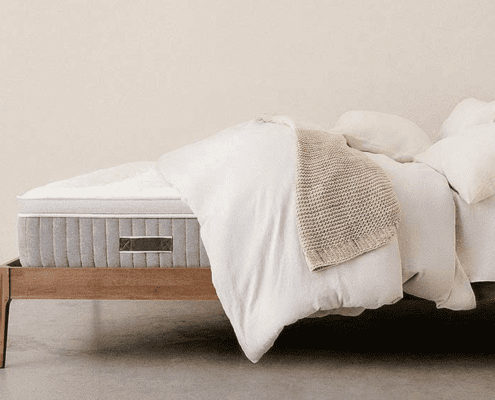 The all natural and organic materials used in the production of a mattress, as well as an eco-friend image of the brand is a good selling point. Overall comfort that the mattress provides is admirable. 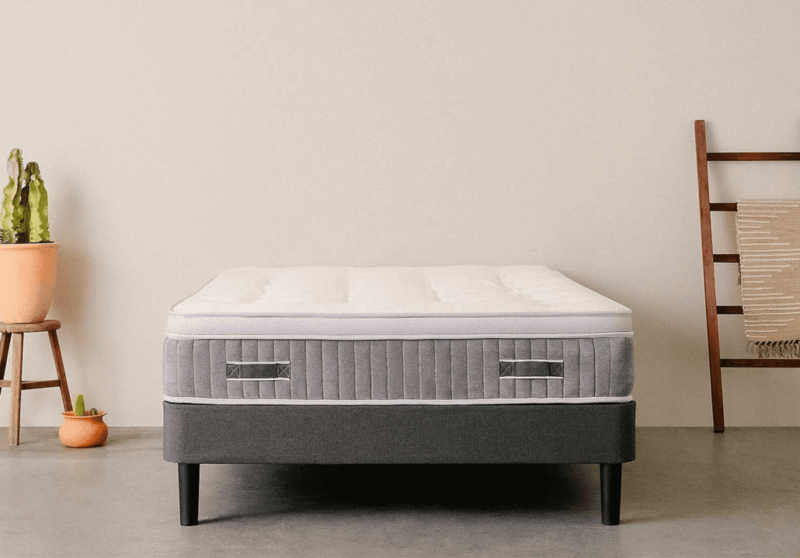 The above average firmness of the mattress, in combination with individually wrapped coils, provide a natural comfort. The edge support is outstanding and the cooling provided by organic materials will save you from being trapped in a furnace. The lifetime warranty that comes with the product is alone enough to convince a customer of high quality. No company would back up their product with such warranty if they were not sure about its durability. And it shows, the customer reviews on the website are overwhelmingly positive. People are loving the product. And I don’t see any reason they should not. There is practically no off-gassing issue. The only thing that it does not excel in is a motion reduction. However, it does stand out in handling this issue better than most other Latex Hybrid mattresses. Overall I would give Awara Hybrid Mattress a very high score.